“8” is the new “9” – Till now Mobile numbers have always been identified as starting with number 9, but that will change now. 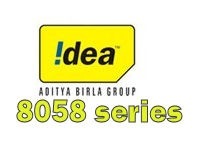 Reliance and Idea have launched new mobile number series starting with “8”. This had to happen – Otherwise how is India going to accommodate more than 10 million mobile subscribers every month. In all probability we have already crossed 500 million Telephone subscriber mark, majority of them being Wireless subscribers. Similarly, Idea Mobile users in Rajasthan, Maharashtra and Goa will be amongst the few in the country to get the new series of mobile numbers starting with ‘8’. Like Reliance, ‘8’ number series is available for new connections in both pre paid and post paid category. New 10 digit IDEA numbers in Rajasthan will be of “8058” series. In 2008, there was a news that very soon we would be having 11 digit telephone numbers – I dont know where are we on that front?